Fire and Water don’t mix. SophiaI’m Sophia Henley, your typical college freshman. I never expected a lion to be stalking me, nor for fire to come shooting out of my hands to protect my sister. Next thing I know, a drop-dead gorgeous guy shows up on my doorstep to sweep me away to a magical school, where I’ll learn to control my element and bond with a powerful creature called a Familiar.I don’t believe I’m the savior of an ancient tribe, or the missing piece of a prophecy that’s more myth than reality. Worst of all, I’m forced enter the Elemental Cup, where I’ll either earn my place in this society… or die trying.LiamThe night I met Sophia, I didn’t think we’d form an undeniable connection. But I’m from the Water tribe, and she’s fire. I’m forced to push her away even as I’m falling for her.I lost everything, yet Sophia makes me whole again. Our world is fixed on keeping us apart, but we’re in this tournament together. We have to keep each other alive at any cost — or I’ll give my life for hers.It’s pretty clear. If I continue to play with fire, I’m going to get burned. **An astonishing start to a brand new series, The Fire Prophecy is the first book in the incredible and breathtaking Academy of Magical Creatures series. This New Adult college fantasy is packed full of laughter, romance, and extraordinary worlds. Fans of Harry Potter are going to LOVE this book! Sorry, this missed the mark for me.I didn’t like Liam at all. Yes, I know he was hurting. Yes, I know he was angry. And yes, that was understandable. But he was too grumpy, too impatient, and his negative energy dragged me down. The black cloud above his head invaded mine as well. And Sophia was a mystery to me. She was at times very childish (VERY childish for an 18yo! ), yet she made statements like this: “The top of her head (…) pressed firmly onto d**k”. That’s contradictive to her naïvety! A Sorry, this missed the mark for me.I didn’t like Liam at all. Yes, I know he was hurting. Yes, I know he was angry. And yes, that was understandable. But he was too grumpy, too impatient, and his negative energy dragged me down. The black cloud above his head invaded mine as well. And Sophia was a mystery to me. She was at times very childish (VERY childish for an 18yo! ), yet she made statements like this: “The top of her head (…) pressed firmly onto d**k”. That’s contradictive to her naïvety! And she was snappy one moment, and kind the next. Shy, then all of a sudden defiant and almost aggressive. She didn’t feel real. And the story was kinda like that too. Yes, I know it’s fantasy so it can’t be real. But what I mean: there were very childish elements, like elephants with rainbow manes and Sophia’s behavior. And then there were the age 16+ bits, because this definitely was a 16+ book. Who is your target audience? I’m sorry to say it wasn’t me… At one point I did feel a spark of excitement, but then there were so many magical things thrown at me, some things that weren’t even relevant to the story, that my excitement died down quickly. Especially in the beginning, while building the world, there was too much deviating from the storyline, making it confusing and frankly, less interesting. Oh, there was promise. I liked the idea. And some of the fantasy elements were quite original. And there WERE some intriguing things happening. But not enough to save this book for me. So: I didn’t like Liam, nor Sophia, nor the story. Too much negativism. I’m out. Sorry. Can’t win ’em all. This was a good start to a new series. It was a preorder, so it counts as a TBR book. I liked Sophia and Liam, and the progression of their relationship. The Elemental Cup was quite interesting, and I hope that the things we learned are explored more in the next book. (view spoiler)[Like Sophia's power, the meaning of the totem, and Sophia telling Liam about Esis. (hide spoiler)] I liked that the book was longer, at over 400 pages. It was really nice, and made for better reading. Additionally, I This was a good start to a new series. It was a preorder, so it counts as a TBR book. I liked Sophia and Liam, and the progression of their relationship. The Elemental Cup was quite interesting, and I hope that the things we learned are explored more in the next book. (view spoiler)[Like Sophia's power, the meaning of the totem, and Sophia telling Liam about Esis. (hide spoiler)] I liked that the book was longer, at over 400 pages. It was really nice, and made for better reading. Additionally, I enjoyed learning about the culture of the Hawkei and the various tribes. It was pretty interesting. I do wish that there had been more detail about different classes. That felt a bit overlooked, but the book did have a bit more of an emotional focus, as Sophia, Liam, Imogen, and Jonah developed friendships and Sophia and Liam got romantically involved. I loved Liam's character, and the preview of the next book broke my heart for him. Sophia was also awesome. I loved seeing her gain confidence and power. I look forward to book two! 4 stars. Wow, what an incredible ride this story was! !The characters were phenomenal! I absolutely loved reading about and meeting Sophia and Liam. I felt as if I could connect with these characters. I am all for team Liam. My connection with him was the strongest I think, because of his past and how he was treated.The story-line was incredible. I literally couldn't put this book down. It was so full of magic, deception, mystery, suspense and action all rolled into one amazing story. I couldn't help but Wow, what an incredible ride this story was! !The characters were phenomenal! I absolutely loved reading about and meeting Sophia and Liam. I felt as if I could connect with these characters. I am all for team Liam. My connection with him was the strongest I think, because of his past and how he was treated.The story-line was incredible. I literally couldn't put this book down. It was so full of magic, deception, mystery, suspense and action all rolled into one amazing story. I couldn't help but keep turning pages and each chapter had the main characters POV too that made just HAVE to read more. Both Linski and Rades are very talented authors but this story is proof that they are an unstoppable force to be recon with. I highly recommend this read. Good story line, just found it a bit chunky or awkward, lost it's flow in some of the detailed parts. Sophia Henley’s family has been keeping secrets from her, her whole life. The secrets are coming out now and Sophia doesn’t know who to believe or what is real. One evening Sophia and her sister is attacked and Sophia uses her magic for the first time but has no idea what is going on or what happened but she is going to find out the truth and what her family has hidden from her all these years. Then one evening a really hot dude shows up on her doorstep and literally whisks her away to a magical Sophia Henley’s family has been keeping secrets from her, her whole life. The secrets are coming out now and Sophia doesn’t know who to believe or what is real. One evening Sophia and her sister is attacked and Sophia uses her magic for the first time but has no idea what is going on or what happened but she is going to find out the truth and what her family has hidden from her all these years. Then one evening a really hot dude shows up on her doorstep and literally whisks her away to a magical school. At this magical school they will teach her all about magic and how to use her own magic. Sophia starts to really like this dude, Liam but she soon learns that they can’t be together. Sophia is Fire and Liam is Water. Fire and Water don’t mix but that is also true for all of the houses. But Sophia did not grow up knowing or living all these rules like Liam and thinks that breaking a few rules can’t hurt anyone or can it? The Elemental Cup is coming up and Sophia learns that she must enter as she is not been given a choice in the matter. She must make it through the Elemental Cup challenge to find out where she belongs in this magical world. The trials she must face could cost her, her life. This has been one amazing journey through this magical world of magical creatures at the Orenda Academy. I have loved getting to know all the characters and their familiars. The Fire Prophecy is a great introduction into the Academy of Magical Creatures series. It captured my interest from the first page and kept me in its grasp all the way through until the end. It kind of reminded me of The Hunger Games you know when they were competing in the Elemental Cup with all the trials they had to face. The ending really blew me away I never saw that one coming not even once. It really floored me. The Fire Prophecy is a little longer than most books and it did take me a while to read but in all fairness I did start it the day before Thanksgiving and read it through the holiday day week and weekend. But I must say that The Fire Prophecy is a great book to read through the holidays or during a busy time as you do have more time to read it and to savor every little morsel between each and every one of its magical pages. I can’t wait to check out the next book in the series and to see what that ending may entail in the next book. If you like fantasy worlds involving magic and magical creatures then you are going to love The Fire Prophecy, an introduction into the magical world of Academy of Magical Creatures. This book really fell flat for me. It seemed overly familiar: a secret magical school with 4 different houses, a dangerous tournament - you know the one. There were other stereotypical characters like the quirky girl and gay best friends, the pretty mean girl and her minions,... And the forbidden love has been done so many times it's getting kinda boring.The language was quite juvenile yet there was a lot of pointless vulgarity that made it seem like the authors were trying too hard. The relatio This book really fell flat for me. It seemed overly familiar: a secret magical school with 4 different houses, a dangerous tournament - you know the one. There were other stereotypical characters like the quirky girl and gay best friends, the pretty mean girl and her minions,... And the forbidden love has been done so many times it's getting kinda boring.The language was quite juvenile yet there was a lot of pointless vulgarity that made it seem like the authors were trying too hard. The relationships did not feel genuine. The immediate hatred between the 2 main characters just felt forced. The book mostly felt like a vulgar retelling of other typical fantasy books. It was ok. 2.5 stars isn't an option so I'm putting 3 for now.I'll try to keep my complaints vague enough to keep from making them "spoilers," but I may fail.It feels like they took a lot from Harry Potter and the Hunger Games and mashed them together. The magical society doesn't really make sense. "It is our sacred duty to care for the magical creatures... except when we do everything in our power to try to kill them and our kids for our entertainment. "The romance was very much a 'teen romance, It was ok. 2.5 stars isn't an option so I'm putting 3 for now.I'll try to keep my complaints vague enough to keep from making them "spoilers," but I may fail.It feels like they took a lot from Harry Potter and the Hunger Games and mashed them together. The magical society doesn't really make sense. "It is our sacred duty to care for the magical creatures... except when we do everything in our power to try to kill them and our kids for our entertainment. "The romance was very much a 'teen romance,' with a whole lot of "I love you, I hate you, I love you, I can never actually tell you how I'm feeling, but I've loved you since I first met you." Bleh . We can't be together 'because rules' which can never be changed even though the rules were only put in place 200 years ago 'because elders decided. 'They live in modern day America, yet somehow the school gets away with hosting the hunger games every year in which a dozen or so young adults are brutally murdered by the teachers in an attempt to make them 'prove themselves worthy.' And why? 'because tradition.' ugh There were a lot of editing errors, but I've come to expect that when reading books from Kindle Unlimited. What really bothered me was the way they sometimes used words strangely. The first example I highlighted & noted of this was "I was probably going to pass out from sheer overwhelm before we made it to the school." WAT?! I'd never seen overwhelm used in this way, and the authors did it at least twice in this book. It would have made sense if they had said "I was so overwhelmed, I was probably going to pass out before we made it to the school." Overwhelm is a verb, but the authors are using it as a noun. I don't have a degree in the English language, so I'm not 100% sure it is technically incorrect. It was just jarring, felt wrong, and pulled me completely out of the story each time it happened.I'm invested enough in the story enough that I will likely read the next one. But I am definitely giving myself a break and reading something else in between. 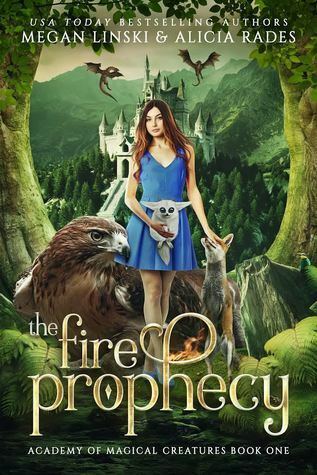 The Fire Prophecy was an amazing fast-paced fantasy novel that is kind of like a New Adult romance version of Harry Potter.The story moved along very smoothly. At first I was confused at all of the terms that were thrown at me (in all honesty I don't typically read fantasy) but soon caught up. I fell in love with the characters, especially Sophia, and also the setting. It was so magical and captivating. It was very eventful and the ending was exciting (I won't share it here because I don't want The Fire Prophecy was an amazing fast-paced fantasy novel that is kind of like a New Adult romance version of Harry Potter.The story moved along very smoothly. At first I was confused at all of the terms that were thrown at me (in all honesty I don't typically read fantasy) but soon caught up. I fell in love with the characters, especially Sophia, and also the setting. It was so magical and captivating. It was very eventful and the ending was exciting (I won't share it here because I don't want to spoil the book. )I loved how the fantasy had genuine life elements in it. The characters didn't spend the entire story on a momentous trek, which I liked. They matured and became more confident in their abilities.This book only got four starts because there were some cliched parts and some of the writing wasn't real vivid.Overall, this is a great and creative story and I can't wait to read the next book in the series.I RECEIVED THIS BOOK FROM THE AUTHORS IN EXCHANGE FOR AN HONEST REVIEW. THIS DOESN'T AFFECT MY VIEWS OR OPINIONS IN ANY WAY. THANK YOU TO THE AUTHORS! This book had an interesting premise, but the execution kept knocking me out of the story. There were massive inconsistencies in the book, like the prohibition of cell phones for the MC at the college, yet a town with modern conveniences just outside the door. Why can't she go into town and make a call? A murder happens on TV, yet no one prosecutes the murderer! Worse than that is the reaction of the students to our MC. She is supposed to be someone who is going to give huge power to one segment This book had an interesting premise, but the execution kept knocking me out of the story. There were massive inconsistencies in the book, like the prohibition of cell phones for the MC at the college, yet a town with modern conveniences just outside the door. Why can't she go into town and make a call? A murder happens on TV, yet no one prosecutes the murderer! Worse than that is the reaction of the students to our MC. She is supposed to be someone who is going to give huge power to one segment of the new society that she is entering, yet EVERYONE in that segment hates her and picks on her. I can understand why the other segments of society might start out disliking her, but why would those who stand to benefit from her want to get on her bad side?Finally, the MC actions and reactions often seem driven more by the author's plot requirements rather than being organic to the story. All in all, a very disappointing treatment of a promising idea. I love magical and mystical reads and absolutely love when they include familiars it just makes things more interesting. This book was full of it all along with the hatred between elements and elemental magic and all. The attitudes of the different houses it all brought to mind Harry Potter and Hunger Games and not in a bad way. I do love the direction the story is going in and yes was totally floored by the cliff-hanger, so now you have been warned it isn't a standalone series. There is plenty I love magical and mystical reads and absolutely love when they include familiars it just makes things more interesting. This book was full of it all along with the hatred between elements and elemental magic and all. The attitudes of the different houses it all brought to mind Harry Potter and Hunger Games and not in a bad way. I do love the direction the story is going in and yes was totally floored by the cliff-hanger, so now you have been warned it isn't a standalone series. There is plenty of action and yes a forbidden love interest. I have to admit I did take points off for the language. I was disappointed that there was so much vulgarity when this is supposed to be a YA and it just seemed over the top and the first time it has bothered me in this authors books. Other than that it is a great read that will keep you turning the pages. Finding themselves and digging deeper than they ever thought. This merry band of misfits take the academy by storm. The Fire Prophecy (Academy of Magical Creatures #1) is a new adult college fantasy that is cutting-edge, modernistic, & magical. World building descriptions & settings are well detailed and described. Characters are compelling and well seasoned. Supporting character's are tenacious & resilient. The writing style is exhilarating and fits the genre perfectly. A mutiplex fantasia that is unparagoned & brimming with magic and magical creatures. I absolutely love the narrative of this The Fire Prophecy (Academy of Magical Creatures #1) is a new adult college fantasy that is cutting-edge, modernistic, & magical. World building descriptions & settings are well detailed and described. Characters are compelling and well seasoned. Supporting character's are tenacious & resilient. The writing style is exhilarating and fits the genre perfectly. A mutiplex fantasia that is unparagoned & brimming with magic and magical creatures. I absolutely love the narrative of this new world based on the natural elements air, earth, fire, & water. Each character is a elementai and must learn to maintain & use their skills. Suffused with deception, family, friends, games, love, lies, powers & secrets. A prophecy is the key to this highly poignant and intriguing fantasy. I love that each character has their own familiar (animal). Overall, a exquisite and ensorcelled read. I cannot wait to read the next book in this spellbinding series. This is not your ordinary new adult fantasy. A book filled with everything you could ever wish for. Adventure, mystery, magic, suspense, romance, all in one phenomenal book. The Fire Prophecy was an amazing beginning to the series. The characters were well-defined and the plot was enthralling. The world that the authors created was so detailed and well-written to the extent that I felt like I was in the middle of the action and a character in the book. I couldn't put it down. I was hooked from t This is not your ordinary new adult fantasy. A book filled with everything you could ever wish for. Adventure, mystery, magic, suspense, romance, all in one phenomenal book. The Fire Prophecy was an amazing beginning to the series. The characters were well-defined and the plot was enthralling. The world that the authors created was so detailed and well-written to the extent that I felt like I was in the middle of the action and a character in the book. I couldn't put it down. I was hooked from the beginning until the end. It made me keep on guessing on what would happen next. All the games, deception, lies and secrets will keep you at the edge of your seat. I highly recommend this book especially to those people who love reading about magical creatures, tribes and the four elements. I can't wait and am definitely looking forward to read the next book in the series. I can draw a very easy conclusion after finishing The Fire Prophecy (Academy of Magical Creatures, Book 1): that Megan Linski and Alicia Rades make a powerful writing team. That’s the only way to explain how their combined efforts could come up with a book this much fun. Laughter, romance, action, adventure, thrills, fantastic world-building and a great set of leads in Sophia and Liam, supported by a strong cast of supporting characters. Yup, this book really has it all. But for the fact that I’ I can draw a very easy conclusion after finishing The Fire Prophecy (Academy of Magical Creatures, Book 1): that Megan Linski and Alicia Rades make a powerful writing team. That’s the only way to explain how their combined efforts could come up with a book this much fun. Laughter, romance, action, adventure, thrills, fantastic world-building and a great set of leads in Sophia and Liam, supported by a strong cast of supporting characters. Yup, this book really has it all. But for the fact that I’m literally dictating this review to my husband from my hospital bed I could go on and on with praises - the book definitely deserves it. Since I can’t do that I will simply note that the book is most definitely one to read, it is easy to highly recommend. I’m definitely looking forward to the next book in the Academy of Magical Creatures series. There is sooo much packed in this book it’s hard to narrow it down to a little review. I will say this much, it is magical! Megan Linski and Alicia Rades do a fantastic job of world building. Their characters are great to get to know. I love their quirkiness and distinctions. Their personalities and the way they play off one another is very entertaining. A budding romance between the lead characters, Sophia and Liam, was made even more heightened since relationships from different tribes were fo There is sooo much packed in this book it’s hard to narrow it down to a little review. I will say this much, it is magical! Megan Linski and Alicia Rades do a fantastic job of world building. Their characters are great to get to know. I love their quirkiness and distinctions. Their personalities and the way they play off one another is very entertaining. A budding romance between the lead characters, Sophia and Liam, was made even more heightened since relationships from different tribes were forbidden. We also get to read from both of their POVs so we know what each of them are thinking and feeling. But alas, at the end is that dreaded major cliffhanger. But no matter. One thing is for certain after reading this first book in this series....book two cannot come out too soon. I can easily recommend reading this book. Sophia has lived her entire life believing her sister and her parents are her real biological family. But the truth is revealed when Sophia saves her sister from a lion attack. Forced to leave everything behind, she goes to Orenda Academy to learn how to use her fire magic. Liam, who has water magic like the rest of Sophia's family helps teach her the ropes to some extent at the academy. The problem is, the different elemental houses are not supposed to mix, whether that be friends, date, etc. W Sophia has lived her entire life believing her sister and her parents are her real biological family. But the truth is revealed when Sophia saves her sister from a lion attack. Forced to leave everything behind, she goes to Orenda Academy to learn how to use her fire magic. Liam, who has water magic like the rest of Sophia's family helps teach her the ropes to some extent at the academy. The problem is, the different elemental houses are not supposed to mix, whether that be friends, date, etc. Will Sophia ever learn the truth about why her parents adopted her and how her biological parents died? This story leaves you with a cliffhanger at the end with Liam having to do a difficult task? But will he do it? I can't wait to find out when I read the next book in the series! Really goodI enjoyed Sophia and Liam's story and after the cliffhanger ending, I'm eager for the next one to come out. I felt like this was a loose cross between Harry Potter and the Hunger Games. The whole magical school thing had a HP vibe to it, only the magic was all elemental and instead of pets we got familiars. The elemental cup had the intensity of the Hunger Games and similar life or death stakes, except more than one person could survive and the point of the game wasn't killing each ot Really goodI enjoyed Sophia and Liam's story and after the cliffhanger ending, I'm eager for the next one to come out. I felt like this was a loose cross between Harry Potter and the Hunger Games. The whole magical school thing had a HP vibe to it, only the magic was all elemental and instead of pets we got familiars. The elemental cup had the intensity of the Hunger Games and similar life or death stakes, except more than one person could survive and the point of the game wasn't killing each other. I did feel like the content was a little mature for YA. At least I thought this was YA when I bought it, but I can't seem to figure out how to get Amazon to let me see the genre of a book anymore, so maybe it's intended for a more mature audience. This book has it all! Adventure, magic, a touch of romance, and tons of adorable creatures! I loved learning about this world that Megan Linski and Alicia Rades created. Poor Sophia had so much thrown at her, but she just kept moving forward. She had to learn very quickly about herself so she could survive the Elemental Cup. Liam is broken after his loss, but it seems that with the help of Sophia and the friends they have made, he may just be okay. I am so excited for book 2 so I can learn more This book has it all! Adventure, magic, a touch of romance, and tons of adorable creatures! I loved learning about this world that Megan Linski and Alicia Rades created. Poor Sophia had so much thrown at her, but she just kept moving forward. She had to learn very quickly about herself so she could survive the Elemental Cup. Liam is broken after his loss, but it seems that with the help of Sophia and the friends they have made, he may just be okay. I am so excited for book 2 so I can learn more about Sophia, see more of the familiars, and watch the romances introduced in The Fire Prophecy blossom. At least, I hope they get a chance to after that ending. You'll have to read to find out! Awesome beginning to the series, I haven't read another book quite like this one. If you don't read this one you are missing out. Sophia is fire and Liam is Water and they don't mix apparently, but they have to find out if they can. You have a magical school , romance, prophecy, ancient tribes and a lot of wonder familiars. you have trials to survive and friends to make. This story will keep you glued to your seat wondering what is going to happen now. What an incredible story line, with laughte Awesome beginning to the series, I haven't read another book quite like this one. If you don't read this one you are missing out. Sophia is fire and Liam is Water and they don't mix apparently, but they have to find out if they can. You have a magical school , romance, prophecy, ancient tribes and a lot of wonder familiars. you have trials to survive and friends to make. This story will keep you glued to your seat wondering what is going to happen now. What an incredible story line, with laughter and tears..I can't wait for the next one. Overall rating: 4.8This book totally gave me the same feels as hunger games yet I love the unique qualities this author created. This has the star crossed love, the magical creatures, the life threatening quests, all elements that capture and command our attention. A perfect beginning with just enough resolution to let a reader feel some completion, yet doors still remain open and unsolved. Truly looking forward to the next edition! All my reviews are always voluntarily written. This book was a nice surprise. I don't ususally get into modern fantasy but I just couldn't pass up the trope of "magic academy" plus animal familiars. I was so close to the characters that it's hard not to believe they are fictional. The voice for both sophia and liam is perfect. Very well rounded characters. Action/plot was a teensy bit predictable, but there were enough twists to keep things exciting. I'm clearing my schedule to read book 2 as soon as it's available. Pretty goodI enjoyed this book for the most part. It seemed long though, I'm not sure why. There was great world and character building. The targeted audience is a little unclear. While they are college students, it feels more like high school. The ending sure threw me for a loop though! I can't wait to see what's next! A promising series beginningThere's a magical school, an orphan Chosen One, adventure and romance.The characterization is excellent, and the plot flows well. The magical world is unique and fun, but not as well-realized as Harry Potter.Overall, an excellent book. Too bad it'll be 3 months until the next one comes out! I could not put this book down! The plot and world bring you in, the characters make you stay, and the writing makes you cheer out loud, let out squeals, and all around make your family look at you like your crazy. But it was worth every questionable stare!The only downside is the wait to read the sequal! What a rush....and that ending! I'm loving every aspect of this book! The characters are so much fun, with incredible detail. The world building is phenomenal and the storyline is unique, fantastic and a roller coaster of a good time! Sophia and Liam are incredible, I'm loving their connection! I can't wait for the next book!!! Unbelievable story. Sophie never expected to find fire coming out of her hands nor a good looking guy appearing to take her to school. Obviously Sophie needed to learn how to control her magic. Don’t miss out. I want to scream! this was going so damn good, regardless of Madam Doya and Haley bitchyness, annnnddd then we reached the ending like NO! NO! NO! JUST STOP I DON'T WANT THIS! regardless I cannot wait for book 2 I'm so excited! !